The Nuru gel 250ml classic is a gel that is sold in a compact package and is ideal for your first Nuru Massage. Deliciously smooth and sensual. Buy 2 and get 3! There are many interesting reasons why it might be interesting to choose for the Nuru gel 200 ml classic. This massage gel is indeed for sale in a very compact package and is particularly suitable for massages as Lingam and Yoni. Moreover, you can use them, of course, simply to experience an exciting masturbating moment with yourself. Indeed, the gel has a lovely smooth texture that creates a lot of extra excitement. Are you in other words, also looking for a starter package with a massage gel? Hesitate no longer and choose today for to get this Classic Gel here at Nuru Netherlands! 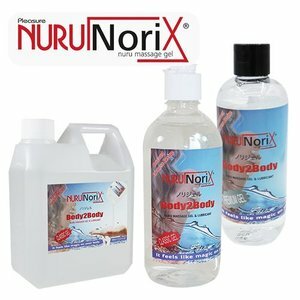 The 200ml Nuru gel is sufficient for a complete Nuru massage.Wil you that little bit extra to the massage? Choose the 300ml packaging. Would you like to know where the Nuru Gel Classic come from? The Nuru massage gel is originally from Japan. It is a natural product which in the traditional manner is made from a combination of water and seaweed. When you choose to buy these Nuru gel you will notice that you choose a product that is not only delicious in use, but is also provides a direct benefit to your skin. Also, if you wish to undergo nice skin therapy this massage gel will introduce you to many interesting advantages. The fact that the seaweed is one of the key ingredients of this gel there also contributes to this.